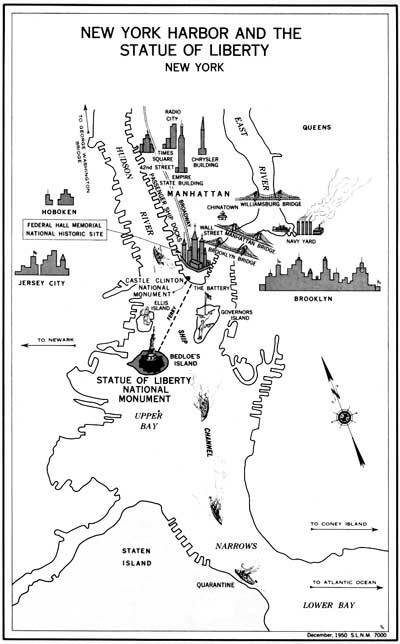 THE NUMBERS given in the first part of this guide section (shown below) correspond to the numbers on the map and will enable the visitor more clearly to orient himself as he tours the statue. 1. Entrance to the base of the statue is through the high walls of old Fort Wood, through what was originally the fort's principal sally port. Its doors are 4 inches thick. To the left of these heavy doors is a bronze tablet on which is inscribed the Emma Lazarus sonnet, The New Colossus, quoted on page 1. Of the many poems pertaining to the statue, this is the most widely known. It was written in 1883 for the Portfolio of the Art Loan Collection to aid the pedestal fund. 2. The walls of the fort, more than 20-feet thick at the base, are pierced by a corridor of brick vault-work which opens into the passageway leading to the stairway and to the elevator within the pedestal foundation. A small fee is charged adults for use of the elevator which goes to the balcony level, near the top of the stonework, a height equal to that of a 10-story building. In the corridor beyond the elevator shaft several interpretive wall plaques are mounted. 3. During pleasant weather, many visitors take the stairway, reached by a passageway on the right side of the sally port corridor to the promenade which, more than 50 years ago, was the terreplein, or gun platform, of the old fort. 4. Now paved, the space between the wall and the terraced lawn surrounding the pedestal provides a pleasant walk and affords an opportunity to study the details of the statue's construction. 5. From the promenade, stairways lead to the second level within the pedestal. Here are the dedication tablets presented by the Franco-American Union, donor of the statue and the American Committee which erected the pedestal. 6. Six stories above is the fourth level, at the foot of the statue. On this floor are several additional plaques, like those in the passageway below, upon which are excerpts from the written works of great Americans. From here one may ascend the spiral stairway system to the crown, 12 additional stories above, or go out on the balcony to view New York Harbor and read the interpretive labels which describe the surrounding area. 7. In the spiral there are 2 stairways, each of 168 steps, winding about the same central column within the towerlike supporting structure of the statue. One is for ascending, the other for descending. There are two rest platforms, situated at one-third and two-thirds of the distance to the top, which enable visitors to pause without delaying those behind them. Anyone finding the climb too arduous may cross over to the descending stair. The right arm, which holds aloft the torch, has been closed to the public for many years. The ladder in this arm is now used by the maintenance staff in replacing the lighting equipment in the torch. 8. At the top of the stairway is the observation platform within the head260 feet above sea level and large enough to accommodate 30 people. Visitors may look through a series of 25 windows which are the jewels of the crown beneath the 7 rays of the diadem. From this level can best be seen the tablet of the law in the left hand of the Goddess of Liberty, bearing the Roman letters of the date July 4, 1776. From within the crown, or more conveniently from the balcony surrounding the pedestal, a splendid view is afforded of the changing panorama that is New York. On clear days objects within a radius of 15 miles can be seen. To the north is the George Washington Bridge over the Hudson River. The Manhattan sky line, the bridges spanning the East River, Governor's Island, and the main channel through which pass the world's largest ships are in the immediate foreground. To the south, the visitors can see the shore of Raritan Bay, N. J., and Staten Island, guarded by Forts Hamilton and Wadsworth. To the southwest is the great steel arch bridge over Kill van Kull, joining Staten Island to the New Jersey mainland. In this area are acres of tanks and refining equipment which identify the region as one of the largest oil-refining centers in the United States. Due west of the island are the heavily industrialized areas of New Jersey. The eastern terminals of the Lehigh Valley, Jersey Central, Lackawanna, and Baltimore & Ohio Railroads are located here. Farther west and northwest, the great Pulaski Skyway and the series of bridges over the Passaic and Hackensack Rivers are easily discerned. To the north also lies Ellis Island. 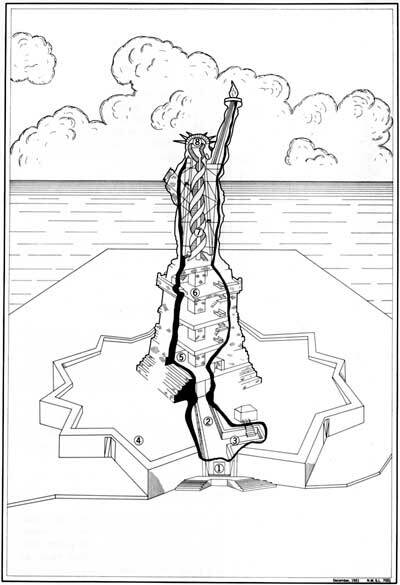 Through this island's gateway, from 1892 to the beginning of World War I, came 10 million immigrants, to whom the Statue of Liberty represented the freedom which they sought in the New World. 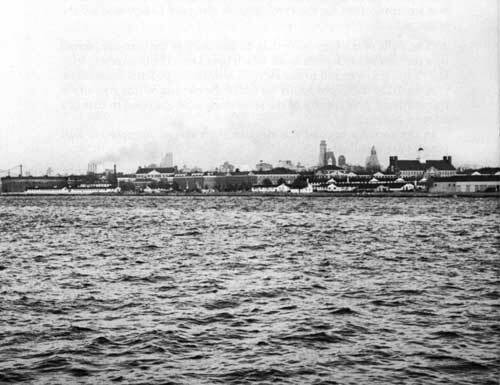 Today, most immigrants see Ellis Island only as they sail by. Only those who cannot pass the immigration inspection at Quarantine in the Narrows are held at Ellis Island until their cases are disposed of. 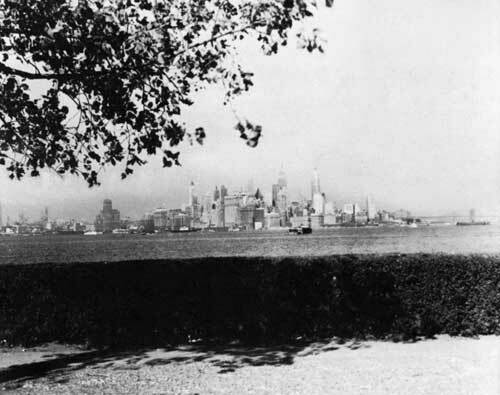 Views from Bedloe's Island: Manhattan sky line (above); Governors Island (below).